The Finnish conductor Paavo Berglund (b. 1929) has won his reputation on the podiums of numerous major orchestras, including the Berlin Philharmonic, the London Symphony, the Dresden Staatskapelle, the St. Petersburg Philharmonic, the Moscow State Philharmonic, the Leipzig Gewandhaus Orchestra and the Israel Philharmonic. 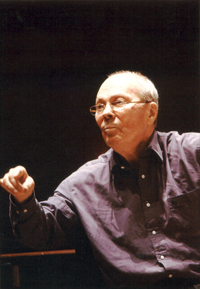 From 1962 to 1971 Mr. Berglund held the post of Principal Conductor with the Finnish Radio Symphony Orchestra. In England, where he was Principal Conductor of the Bournemouth Symphony Orchestra from 1972 to 1979, he has gone on to frequent engagements with such ensembles as the Royal Philharmonic Orchestra, the London Symphony and the City of Birmingham Symphony Orchestra. He has led tours in Europe with the BBC Symphony, the Royal Philharmonic Orchestra, the Chamber Orchestra of Europe and the Oslo Philharmonic Orchestra. Berglund returned to Finland in 1975 to the post of Principal Conductor of the Helsinki Philharmonic Orchestra. From 1987 to 1991 he was Principal Conductor of the Stockholm Philharmonic Orchestra. He assumed the post of Principal Conductor of the Royal Danish Orchestra in Copenhagen in September 1993. Mr. Berglund made his North American debut in 1978, leading the American Symphony Orchestra in New York City. Since then he has conducted many important North American ensembles including the San Francisco, Pittsburgh, Toronto and Baltimore symphony orchestras, the National Symphony, the New York Philharmonic and the Cleveland Orchestra. Paavo Berglund has recorded the complete Sibelius Symphonies with the Bournemouth Symphony Orchestra, with the Helsinki Philharmonic, and for the third time with the Chamber Orchestra of Europe, and complete Nielsen Symphonies with the Royal Danish Orchestra. Among the many honours his recordings have received is a Grammy award nomination for his world première recording of Sibelius's Kullervo Symphony and Diapason d'Or for the Nielsen Symphonies recording. His recording of Sibelius's Symphonies with the Chamber Orchestra of Europe won 'Diapason d'Or', in addition to 'Choc de l'Année 1998' of Le Monde de la Musique. His highly esteemed discography also includes major symphonic works of Rachmaninov, Shostakovich, Smetana and Dvorák, among others.